Meet the Press used to be the number-one Sunday network news program, but ratings have not been great lately, and the show has slid to number 3 over the past few years. 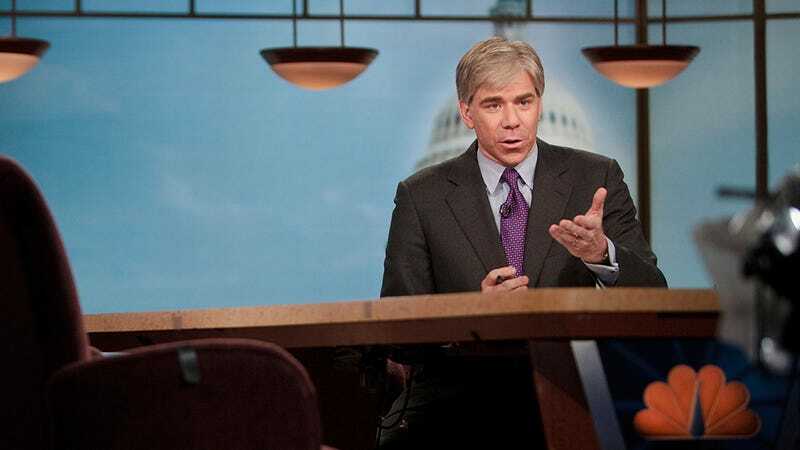 NBC has been taking a closer look at host David Gregory for answers. Yesterday the Washington Post reported that NBC had hired a "psychological consultant" to work with Gregory. Last year, the network undertook an unusual assessment of the 43-year-old journalist, commissioning a psychological consultant to interview his friends and even his wife. The idea, according to a network spokeswoman, Meghan Pianta, was "to get perspective and insight from people who know him best." But the research project struck some at NBC as odd, given that Gregory has been employed there for nearly 20 years. Hmm. That seems… weird. Does analyzing the host's psychology help with ratings? The author of WaPo's original report, Paul Fahiri told Politico's Hadas Gold that he "checked with NBC twice on Sunday about the term 'psychological' and that they had no objections at the time." As you may recall, David Gregory caused a kerfuffle in 2012 when he held up a gun clip while on the air interviewing a man from the NRA. Going even further back, radio host Don Imus once thought Gregory was drunk when he called into the show from India. But these things have never overshadowed the fact that Gregory does a great job covering extremely serious subjects — from the White House to 9/11 to war. If there's anything really weird about him on Meet the Press, it's that he doesn't get the opportunity to break free from the clutches of gravitas and DANCE. He really comes alive when he's dancing.